Please go here for more information about my bevel forging process. Please Note: I don't use any jigs for shaping the profiles or bevels of these straight knives. Each blade is a bit different because they are forged and finished individually. Some are more rounded or staighter, for instance, or have less of the forging marks where the bevels were ground back more. With a 3 inch blade (with forged bevels), this is handy for carving on larger pieces and still have enough length for slicing cuts. The Cherry wood handle is regular length for single handed use (not extra long for two handed use). It is given a satin varnish finish, to make it stand up to kitchen use, as I also sell this as a paring knife. This knife was originally designed by a bassoon player for shaping and scraping reeds. 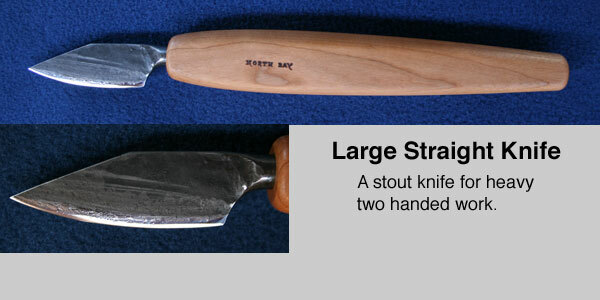 It is also a very versatile general carving knife. The blade is sharpened on both top and bottom. The entire straight edge (on bottom) is sharp and is 1.5 inches long. The rounded edge on top is only sharp along half it's length (at the tip). The other half of the top is thick and unsharpened so your thumb can press on it for greater power and control.